Midfielder Joel Byrom is the main inury concern for Sky Bet League Two leaders Cobblers ahead of Tuesday night’s promotion battle at third-placed Oxford United. The former Preston North End man suffered a neck spasm during the warm-up before Saturday’s 4-0 win at Leyton Orient, with Danny Rose stepping in at the last minute to make his Cobblers debut. 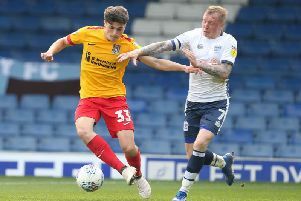 Rose could now be in line to face his former team-mates at the Kassam Stadium, having only left Oxford to sign for the Cobblers last month, but Town assistant boss Alan Knill isn’t ruling out a return for Byrom, who prior to Saturday had been a virtual ever-present in the Town team. The 29-year-old didn’t train with the rest of the squad on Monday, but Knill feels there is still a chance Byrom will be fit enough to face the Us, the player even undergoing acupuncture to try and recover in time. “We are not sure whether Joel will be fit or not yet, and we will give him as much time as possible,” said Knill. “He has been having acupuncture on his shoulder. “We were doing a bit of possession in the warm-up on Saturday, and he just moved and the next minute he can’t move, so it has obviously gone into spasm. Knill also had some words of praise for Byrom’s replacement on Saturday, and says manager Chris Wilder will have no hesitation in picking Rose to start at Oxford if Byrom doesn’t make it. “Danny did excellently, but it’s not a shock,” said Knill. “We don’t bring people in that we hope are going to work out, we knew that Danny would be fine with us and the way we play. “When Joel went down in the warm-up, the selection was between Danny and Jason Taylor, and straight away Chris went ‘Danny’.